The Donkey Chronicles was a series of blogs I originally published between 2013 and 2014 as part of a community service project. I have re-edited the photographs and will upload the blogs one by one over the coming months. These are the anecdotes chronicling my adventures with The Donkey Sanctuary as I joined the mobile clinics on their work around New Delhi and Gurgaon. It was an honor and a privilege to be involved in the project, a philosophical adventure that is close to my heart as I consider donkeys to be the philosophers of the animal kingdom and absolutely admire their resilience and ability to withstand their own loads and carry the burdens with grace and serenity. 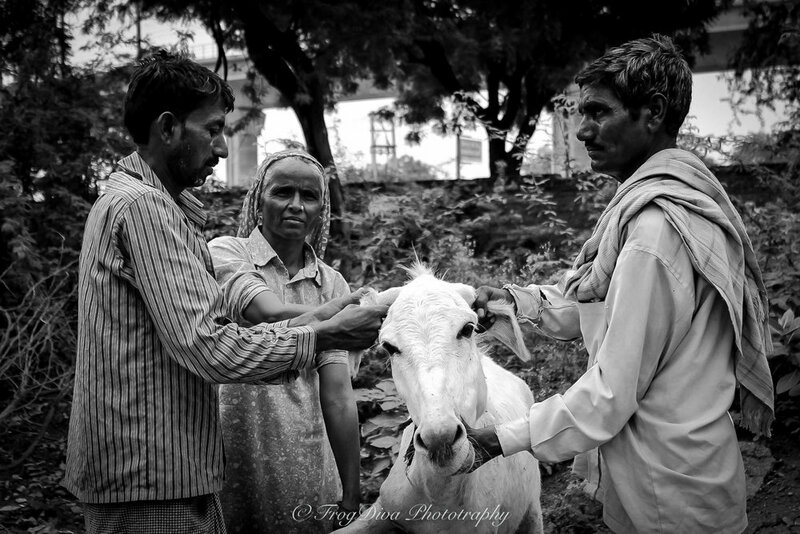 Donkeys in India (and many other countries) are severely misunderstood creatures, often overworked, underpaid, mistreated, malnourished, and although they are work animals, they don’t get the support, recognition and compensation that cows, goats, and horses get. Here in India, the working donkeys are a special group of animals belonging to a fascinating group of nomads who alternate moving between construction sites, brick kilns and mines depending on the season and availability of work. Unlike in the West where the transport of bricks is done with the aid of a cart or truck, it is very much the norm to see donkeys doing the work and they will often be carrying heavy loads of sand or bricks to and fro. It was dark and rainy when I set out on my expedition in search of the office of The Donkey Sanctuary India (TDSI). It wasn’t long before I found myself in a part of Delhi that I had neither heard of before nor set foot on. But hey, what’s the point of an adventure if you’re going to a place that you already know, right? I’ve always had a soft spot for donkeys and it is truly a godsend that I found this organization that is specifically dedicated to the plight of donkeys and mules in India. Two hours later I was buckled into one of the mobile clinics tagging along with a team heading towards Gurgaon. Each mobile clinic team consists of a vet, a dresser (one who changes the dressing of the injured donkeys), and a driver. The dresser and driver might as well be called paravets because they handle the donkeys with such expertise. There is usually a community developer or education person as well but not with this particular team, hence the extra spot in the car for me. First stop was a follow up visit with two injured donkeys at an animal shelter somewhere in the middle of nowhere, for lack of a better description. We drove past the farm houses and slowly but surely ran out of “civilization” when this animal shelter popped up in the middle of a jungle area. The welcome committee consisted of at least 12 dogs (at least those who were able to walk around) who greeted us enthusiastically. Within five minutes of our arrival I had been pounced on, nudged, barked at, and sniffed by all the canines. Since it rained in the morning, everything and everyone was wet and muddy, so my kurta was smeared with whatever it was the dogs had been stepping on – and it wasn’t all mud. Next stop was Gurgaon to visit the donkey owners’ community. After having worked many years in Development Cooperation, my mental image of rural (or urban) communities was based on my previous experiences in Bangladesh, the Philippines, and several parts of India, which generally meant a population of 10 – 12 families at the very least. First of all, getting there was an adventure in itself. We turned off from the posh highway leading to new high rises in Gurgaon and entered what seemed to be one of the urban slums. A few meters down the bumpy path the car came to a standstill and we had to get down and walk the rest of the way. I was really, really glad I had my hiking shoes on because I could hardly call what we walked on a path! Have a look a photos I took on the way back (I was too busy trying not to fall in on the way to the community that I completely forgot I had my camera with me). The tiny community of donkey owners was comprised of five families, all living in makeshift huts in a clearing. There is no running water or electricity here and all the water they have is collected from the rain or they have to haul it from the closest tap they can find. The purpose of the visit was to introduce and explain the rabies and tetanus vaccines for the donkeys in an ongoing effort to educate the owners on a more sustainable care of their working donkeys. The TDSI team was well known to the community members so we were welcomed like old friends. Three charpais (woven beds) were dragged out into the center of the community for the meeting and everyone took their seats. I was bewildered by the contrast of my surroundings. Here I was in the simplest of settings and all around us were these brand new modern high rises that surely these humble folk had worked on at some point, the donkeys most likely having carried all the bricks! The nomads who hail mostly from Rajasthan (at least those here in Delhi) are a shrinking community, especially with a lot of the construction work going mechanical and many of the former donkey owners opting to invest in mules instead. It is quite prevalent to find that the current owners don’t want their children to follow in their footsteps and hence to everything they can to give the next generation a better future, one that involves education and a proper office job. My spoken Hindi isn’t good enough to carry on a conversation with the community members, but I was able to follow the mini lecture. My camera, on the other hand, broke the ice immediately (they gave me their permission to take pictures). Once I showed them the photos I had taken of them – ah the wonders of a digital SLR camera - they gamely posed for more, eager to show off their own donkeys. Each donkey in that drove had his/her own personality, one more skeptical than the other. They were not as friendly as those in the animal shelter so I didn’t attempt to pet them. It was an entirely new world to observe these people interact with their donkeys. Whereas the veterinarian team always holds the donkeys steady with a harness and a leash, the donkey owners held the donkey by the ears, twisted the ears counterclockwise and held up one of the front paws. Trying to convince the donkey to hold still for this is no easier than putting on the leash though! Vaccines administered, we were served mango juice. Once again I was stunned by the generosity and hospitality of this humble community. Here they are with barely a roof over their heads and yet they bought a bottle of mango juice for us. There were 13 of us who shared the juice – we managed to skillfully avoid drinking the water – and when we stood up to leave at least two of the women insisted that we stay for dinner. If anything, my first visit with The TDSI team was a hoot. I got off at the metro station looking like the unglamorous disaster that I felt like – dirty, sweaty and smelly but I was on cloud nine. I eagerly look forward to my next visit with the mobile clinic. In the meantime, dear reader, please check out the links to The Donkey Sanctuary UK, India or any other country that you might be affiliated with.